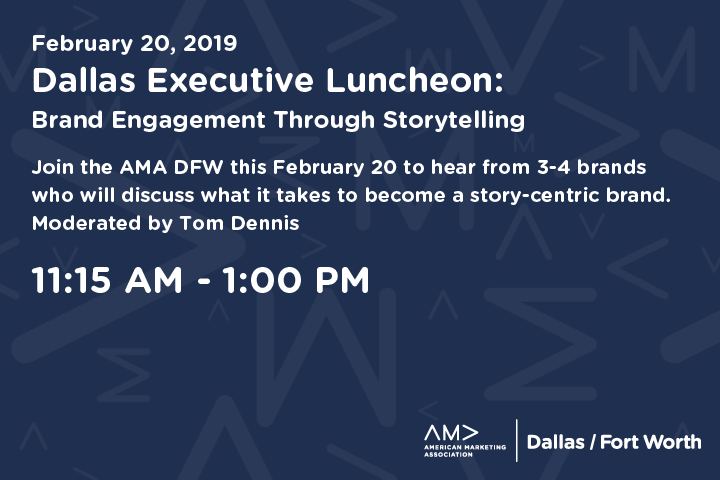 This February 20th join the DFW AMA for a special Executive Luncheon! Russ Klein, the national CEO of the American Marketing Association, will be presenting a dynamic presentation on Where Brand Storytelling is going and what marketers need to do to prepare. Russ has led teams on numerous brands, such as Gatorade, McDonald’s, Maytag, Keebler Cookies, Wilson Sporting Goods, Church’s Chicken, Boston Market, and United Airlines. Russ has served as the CMO of Arby’s, the CMO of 7-Eleven, the CMO of Dr. Pepper / 7 UP and the President of Burger King. Russ will speak on the Future of Brand Storytelling, why the best stories don’t come from brands, how to use cultural tension to inspire your brand storytelling, and the increasingly imperative of experience design. Come join the AMA DFW for the special Executive Luncheon on Wednesday, February 20 @ 11:15 am – 1:00 pm. To receive your $15 discount member ticket click on Enter Promotional Code, enter your member number and click Apply.